Formerly known as New England Pest Control, Big Blue Bug Solutions has been supplying the most all-inclusive pest control services to Worcester, Grafton and throughout Massachusetts, Rhode Island and Connecticut since 1935. We provide a variety of commercial and residential pest control services to fit any pest control need, no matter how severe the infestation may be. If termites, mosquitoes, carpenter ants, or even raccoons or squirrels are causing you unneeded stress, you can trust in the professionals at Big Blue Bug Solutions to get rid of them once and for all. Who Is The Big Blue Bug? 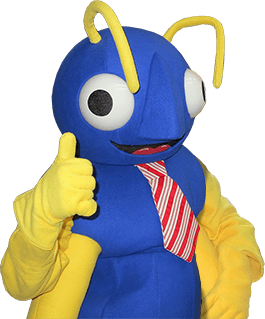 Since 1980, Nibbles Woodaway, the Big Blue Bug has sat atop our Providence, Rhode Island office, becoming a well-known icon through the years. At 58 feet long and 9 feet tall, Nibbles the blue termite tips the scales at 4000 pounds! Constructed of steel and fiberglass, our eastern subterranean termite is 920 times larger than an actual termite. If you are ever in the Providence area, be sure to stop by and visit Nibbles. How Can Pests Damage My Home? Not only can they be destructive through searching for food, water and shelter, their feces and urine can cause serious health risks to your family. If any of these pests have invaded your home, do not hesitate; contact our Worcester pest control experts to schedule an appointment today! At Big Blue Bug, we’d like to offer a few helpful tips to keep annoying insects, rodents and pest birds from making their way into your home. Clean up your kitchen – Regularly sweep or vacuum floors, clean countertops, eliminate clutter in cupboards and pantries and do not leave dirty dishes in the sink. Secure outdoor trash cans – If trash cans are left near doors and windows of your home, make sure they are securely sealed, using bungee cords if necessary. Trim trees and shrubs – Make sure they are trimmed back away from your home so that ants, spiders and squirrels cannot gain entry to your home. Repair holes and cracks in your home – Seal holes around pipes, floorboards and around windows and doors, as well as repair holes in screens. By following these simple steps, you will reduce and possibly eliminate pests from entering your home and keep your family safe from annoying and bothersome pests. For more information on Big Blue Bug Solutions' Worcester pest control services, contact our office today!